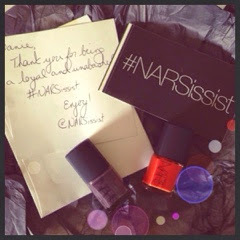 Yes, @NARSissist had actually sent me two of their new nail polishes right to my doorstep! Eeeep! 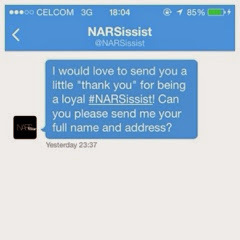 It started earlier this month when I tweeted how my browser immediately suggested Narscosmetics.com as I typed the letter "N". I gave them my HopShopGo address while asking them about the international shipping. Almost immediately they replied that they do and asked if I had a different "ideal" address -- my heart just leaped at that! After just one week (could've been sooner than a week if FedEx had been more efficient!) my goodies were finally in my hands! Now, I've said how much I liked the formulation of the NARS nail polish despite the brush here. The GREAT thing about their new nail polishes, it comes with a wider brush!! Perfect! So yeah, imagine my excitement when one of the nail polishes they sent me were one of the new collection! They sent me Obscura (a shade that I contemplated on getting two weeks ago!) which is described as "lavender charcoal" and Libertango which is a "geranium" shade. Two seriously lovely colours, if you ask me! I haven't actually tried them on since I'm on a work-week stretch and I'm not actually sure if shades of grey are allowed on while anything close to being red is a no-no. But you'll see.. Once I get home from my Adelaide trip, those two will be the first things I play with! rawrr! Is it fitting to note here that I currently have Schiap on my nails? Heehee.. Pretty sure I'll be writing about my recent NARS play-things in the coming blogs!